What dog doesn’t like a ball to chase, right? There are more dog balls and toys on the market today than ever, so finding the best dog ball for your pup should be a pretty easy endeavor, unless you’re Haley of course. 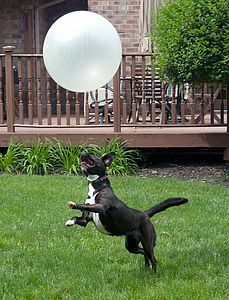 A lot of dogs like Haley enjoy bouncing balls off their noses, so lightweight balls like beach balls are perfect for this type of play. There’s just one problem though, they last about 30 seconds before those canine teeth puncture through the plastic and your dog parades around the room with their fresh kill. I guess it’s like popping bubble wrap to us humans. Haley’s tested a lot of inflatable balls, from beach balls to children’s inflatable toy balls to exercise balls but the only ball with some bounce that can withstand Haley’s fierce fangs has been a basketball. It’s been Haley’s ball of choice so far. Basketballs are pretty heavy though and tough on her nose, so I’m always keeping an eye out for other options. Which brings us to today’s post! A review of the One World Futbol by One World Play Project. Let me tell you a little bit about the One World Futbol. It’s a soccer ball (as we call it here in the US), but it can be used for many types of games. But wait, this is not your ordinary soccer ball because it never goes flat and never needs a pump, even when punctured. The self-inflating bladder built into the ball is designed for durability and practically indestructible play. The reason behind the design is something pretty special too. This ball was not designed for dogs, but designed for empowering youth and strengthening communities worldwide through play. The Buy One Give One program works like this, when you buy a One World Futbol, the project donates a second ball to an organization working with disadvantaged youth in various communities around the world, especially in areas affected by war, disasters, disease and poverty. The program’s founding sponsor is Chevrolet and through the Buy One Give One program, over one million balls have been donated and distributed throughout the world. I discovered this project while researching new balls for Haley and it seemed like a wonderful program, so I decided to give it a try. Here’s my review! The ball arrived soon after I ordered it and Haley, being the master box inspector, was excited to discover her new ball inside. She seemed to like it right away and immediately tested the puncture resistant quality. Even though she left plenty of fang marks on the ball, it passed the puncture test with flying colors. Before taking it outside, I added a bit of air to the ball by pushing in the circle-shaped valve a few times. That’s a pretty cool feature! Once outside, Haley gave it the bounce and chasability test (that should be a real word for dog ball testing, btw). Haley likes to bounce the basketball off her nose and she tries to keep it in the air as long as she can (like in her March Madness Video) and she was able to play the same way with the Futbol. It had plenty of bounce and was lighter in weight than her basketball, which means it’s much easier on her nose. Here’s a look at the Futbol in action! I was really impressed with the One World Futbol because it’s so durable and it has the built-in pump. Haley loves it almost as much as her basketball. The only negative point is she doesn’t chase it as much because it has a softer exterior and she tends to pick it up and carry it in her mouth, rather than push and chase it with her nose. The ball claims to be nearly indestructible and after six months of play, we haven’t had any issues with it and we haven’t had to add any additional air to the ball. Even though it’s covered with fang marks now, it’s held up well to all the tooth abuse. 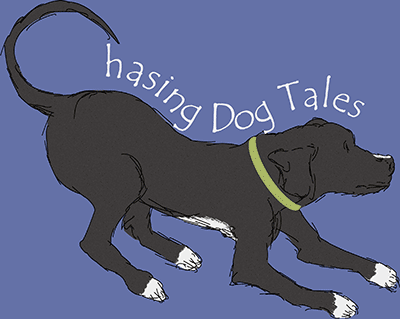 Haley gives it “two paws up” and I would highly recommend it for dogs, kids or adults. Play is important for both dogs and people and it feels good to know that in many places around the world, kids are benefiting from this project and having fun playing with the donated balls. If you would like to buy a Futbol, visit the One World Play Project website. The balls cost $39.50 for the blue or gold color and $44.50 for the green, orange or pink colors. The price includes both balls, the one that is shipped to you and the donated ball and they come in sizes 4 (youth) or 5 (adult). If you’re not interested in buying a Futbol for yourself or your dog, you can still donate a ball for the cost of $25.00 each. Our search for the best dog ball doesn’t end here, but this was a great investment for Haley and a great investment in kids around the world. 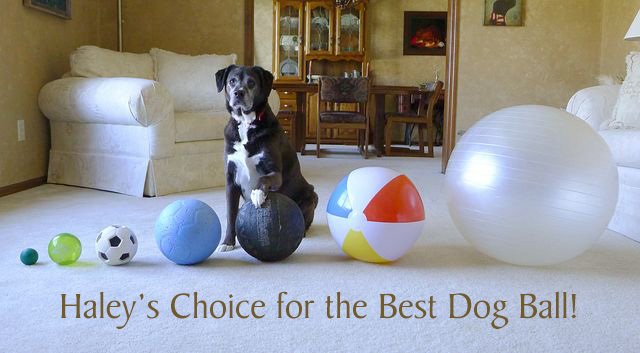 Have you found the perfect ball for your dog? Tell us what it is and what your dog loves about it! I have 2 dogs who would love playing ball outside! Thanks. 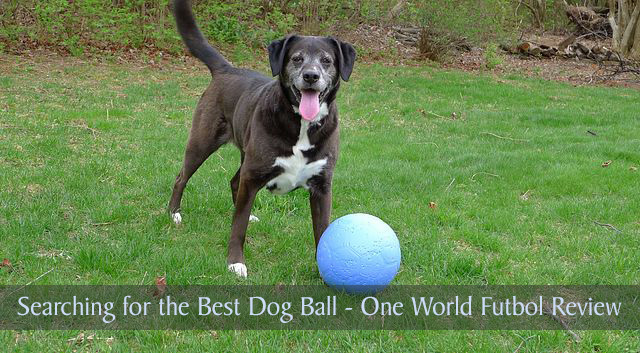 If they’re bigger dogs, they would probably love this One World Futbol. Thanks for coming by today and checking out the post, Sandra! Unfortunately, neither Jack or Maggie play fetch…so they don’t have a favorite. Becca was our ball player and her favorite was an old broken soccer call. She had punctured it, but that made it easier for her to pick up. She also had a pretty bad spinal condition, so she couldn’t play often and since the ball was busted, it didn’t go very far. It was perfect. They all have their favorite toys and ways of playing, don’t they? Even if it’s playing with a punctured soccer ball. Great post, Elaine! I really enjoyed your video. Since I recently created my first video for my site, I was very interested and impressed with the quality of your video and the work that went into it. What video editing software do you use? Where do you get your music clips? The One World Futbol looks like it has a lot of great features. And it is great that they have the program where they donate a ball to an organization working with disadvantaged youth for each ball purchased. I have never given my dog Savanna a big ball to play with so I don’t have any idea if she would chase it around like Haley does with hers. She loves to chase and catch a tennis ball, though! Haley looks like she has a blast with her ball. I might get Savanna a big ball like that to see if she likes it. The videos usually come together pretty easily once you have an idea of the story you want to tell and the general flow. You just import the video clips you want to use and drag them to a timeline where you can see each clip in order, then you drag and drop your transitions in place and add title pages or any text you might want to display over the video clips. I usually wait until the video is completed before selecting my music so I know how long the song has to be, which is easier than trying to duplicate and splice in an audio clip that’s too short in length. Anyway, just import and drag the music file to the timeline and render the final version of the video when you’re happy with it. Those are the basics, but feel free to email me any questions you might have if you decide to give it a try. I would be happy to help. I’m looking forward to watching your next production! That last photo is priceless! My pug would have obliterated all of those balls before I even got the camera set up. I admire your dog’s self-control! Oh my gosh! Her playing with that beach ball in the video! That is soo adorable! Ace has never had a beach ball. I wonder what he would do with one. Destroy it I’m sure! Also loved seeing her play with a basketball and of course the One World Futbol. Do you think Ace would be able to ruin it? He’s, I think, a little bigger than Haley. About 70 pounds. Impressive how it’s held up to her punctures. Ace’s favorite ball so far is still a standard tennis ball. The beach balls are hilarious when you have a few people in one room with the dog. It’s like playing volleyball until the dog manages to get full control of the ball. I was just thinking about your recent post on the “Leave It” command. When a beach ball is involved, Haley’s listening skills are really put to the test with that command. I think the One World Futbol would hold up fine for Ace, since the ball has an interior bladder and is advertised as puncture resistant. Haley’s only made some marks and dents with her fangs, but has never even punctured through the outside shell. I’m glad Ace loves his tennis balls though. That’s the one ball Haley’s never cared for. I think she doesn’t like the furry texture on the outside of the ball. OMD, those last 2 pics and the video are all so cute! She really LOVES to play ball, eh?? I wish Rita loved it that much. (She’s so lazy!) Love how cute she is bouncing that beachball around. Too bad it didn’t last! The Futbol looks very cool – but I’m not sure Rita would know what to do with it! She has an “Unbreakoball” (I think that’s what it’s called) but it’s very hard. It has holes so she can hook her teeth in it, but it’s so hard (hard plastic!) that I don’t want it scratching up our floors, and she can’t play w/ it out back because we have a really steep slope where it would get lost. She loves that thing, but we just don’t have an ideal place to play with it! I think I’ve seen the Unbreakoball before and they are pretty hard, aren’t they? It reminded me of a hollow, mini-bowling ball but it would certainly last longer than a beach ball though! They are REALLY hard plastic. It is like a hollow mini bowling ball. It’s a bit much for inside play. And, like i said, doesn’t work outside for us unfortunately. Your post reminded me about it, so I got Rita’s out and she went nuts playing with it for a few minutes. Got some funny pics/vid so might share that on the blog one of these days. Great! I hope you do post some pics or a video of Rita with her ball. I bet she was thrilled to see it again! So much fun!!! And I just love that last photo!!! Thanks Jenna, Haley was being very patient while posing for that last photo, but she got lots of treats for her cooperation, lol! 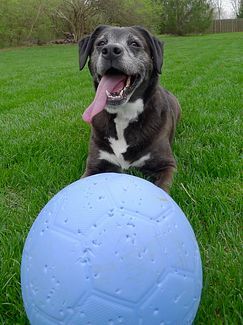 I will have to get a One World Futbol for my fun loving pet! Thanks for the great tip. I think you’ll really like the Futbol and I’m glad you visited us today! This looks like a really cool ball; I love that it inflates from inside & is puncture resistant. With a Husky that plays rough with toys, it’s a great feature! I also love that buying one helps kids. Great video of Haley! I think the Harlem Globetrotters could use her on their team! If the Globetrotters came to town, Haley would probably run off with them, she loves playing basketball that much! I’ve never seen a lightweight ball as durable as the Futbol and I think Isis would probably love it. I still can’t believe how well it holds up to rough play. I have two retrievers and would you believe neither one are big on fetch or playing with a ball. They will chase it a time or two, but then they are done. I do like the idea of being able to donate a ball though, I think that’s very cool. Thanks for sharing! What size One World Futbol did you order for Haley? We have been looking for a good outside ball for Cooper (Husky) and this looks like it might be a good fit. While he is large he only has one canine, as the other had to be removed, so the ball needs to be big but small, or pliable, enough for him to grab a hold of. I love your video Elaine! Great job. Great post Elaine. I look forward to reading more! Thank you Cara! I hope Mila can find her perfect ball one day. Harder balls that aren’t easily chewed are usually not as bouncy or as much fun. I think Haley had one of those light-up balls too but it disappeared a while ago. Thanks for stopping by! Thanks for your video. This looks like a great ball! We have one of the hard “unbreakable” balls for our 19 month old GSD. He loves to play with it but tries to pick it up, actually scraping the surface of the ball and leaving rough gouges. I have to sand it down to keep him from injuring his nose and tongue. He’s one rough boy on toys. Do you think this ball would stand up to his enthusiastic play style? Hi, Nina! I think this might be the ball you’ve been looking for. When researching the article, I tried to find cases online of any dogs that were able to destroy the ball but I didn’t find any. I remember a few GSD owners mentioning it held up really well for their dogs. If you decide to order one, let me know how it works out! 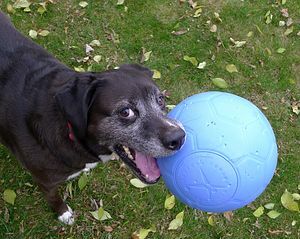 I added the One World Futbol to my list of K9 things to get ~ might make a great Christmas gift for the Buzz boy! That would make a great Christmas gift for Buzz! I looked for a long time and we tried so many different balls for Haley and the One World Futbol is really impressive at how lightweight and durable it is. You’ll have to video Buzz with a beach ball sometime and see what happens, haha! 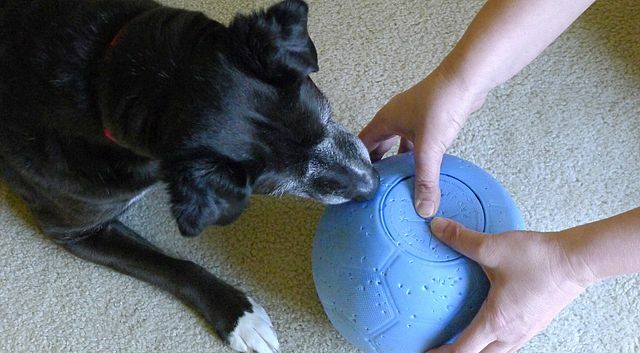 Just don’t leave your dog alone with the one world futbol. While none of the dogs I walk will stay in place to chew on it (they like to chase and pick it up with their mouths), a good number of the other dogs at the dog park steal the ball. I didn’t mind since they were having fun playing with it. But today, I left one of the other dogs alone once he stole the ball. The yellow lab coveted it so much. After around 45 minutes, I went to retrieve the ball from him and found he had managed to chew a hole at the lip of the big circle valve and also started a tear at the lip. The ball is still playable, but now there’s the hole and tear and you know the dogs will now focus on that area! I’ll super glue the tear and try to patch the hole. He must have been on a seek and destroy mission with the ball, lol! I’m glad it’s still inflated but you’re right, once they find a weakness, they’re pretty determined to kill any toy or ball. I know Haley would love to deflate and kill our OneWorld Futbol, but she still hasn’t made any holes or tears. We’ve had it for a long time now and still have never needed to add more air. As a matter of fact, I probably slightly over-inflated it while taking pictures on how to add air and I wish there was a way to let some of the air out to make it a bit softer. It sounds like the ball is a big hit with all the dogs and I hope gluing the tear works out so it lasts a long time. ? 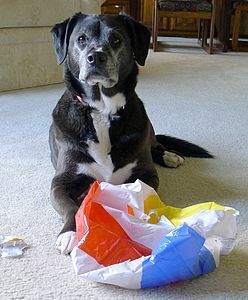 My dog just punctured a beach ball tonight but before she did I could see the delight in her eyes. Thank you for this review! I’m going to order one now! I think your dog will love the One World Futbol, Nancy. We’ve had ours for years now and it’s still holding up as well as on Day 1. It has lots of tooth marks but we’ve never even had to pump it again to add more air. ? You’re so welcome, Eric! The Futbol is still going strong after all this time and Haley still LOVES it! I have no doubt your new dog toys are just as durable and fun! ?